Paul Douglas Westphal (born November 30, 1950) is an American retired basketball player and a former head coach with several National Basketball Association (NBA) and college teams. Westphal has had a storied career in the NBA, both as a player and as a coach. As a player, he won an NBA championship with the Boston Celtics in the 1974 NBA Finals. In addition to being a five-time All-Star selection, from 1977 to 1981, Westphal earned three All-NBA First Team selections and one Second Team honor. Later, he returned to the Finals in 1993 as head coach of the Phoenix Suns. He returned to his home state of California when he was the men's basketball head coach at Pepperdine University from 2001 to 2006. Westphal is a former assistant coach on Lionel Hollins' staff on the Brooklyn Nets. Westphal was born in Torrance, California. He went to Aviation High School and then USC. He was the 10th overall pick in the 1972 NBA draft by the Boston Celtics. After three seasons in Boston, including a championship in 1974, he was traded to the Phoenix Suns. In 1976, Westphal helped the Suns reach their first-ever NBA Finals appearance, where they played against the Celtics. Game 5 of that series is often called "the greatest game ever played" in NBA history. With time winding down in regulation and the Suns trailing 94–91, Westphal poked the ball away from Jo Jo White, took a long pass from Dennis Awtrey, and hit a layup. He was fouled on the play and hit the free throw to tie it at 94–94. In the second overtime, with 15 seconds left and the Suns trailing 109–108 after just making a basket, Westphal stole the ball from John Havlicek after Havlicek received the inbounds pass. This began a chain of events that culminated with Curtis Perry hitting a jumper to give the Suns a 110–109 lead. After the Perry basket and a Celtics timeout, Havlicek got the ball with five seconds left and hit a shot to put the Celtics up 111–110. The buzzer sounded and Celtic fans poured on the floor, thinking the Celtics had won. However, referee Richie Powers correctly ruled that Havlicek's shot went through the basket with two seconds left on the clock. After one second was placed back on, Westphal, sensing that the Suns could get a better shot off if the ball was inbounded at halfcourt, called a timeout that the Suns didn't have while preparing to inbound the ball from under the Celtics' basket. A technical foul was assessed; the Celtics made the subsequent free throw and increased their lead to 112–110. The resulting timeout call allowed Phoenix to inbound the ball at midcourt, rather than go the full length of the court. (As a result of this play, the NBA changed the rules prior to the following season.) Garfield Heard then made a shot for the Suns that sent the game into triple-overtime. With 20 seconds left in the third overtime and the Celtics seemingly in control at 128–122, Westphal scored two quick baskets to cut it to 128–126 and nearly made a steal at midcourt after the second, but failed and the Celtics ran out the clock to the victory. Westphal was 6th in the NBA in scoring average for the 1977–78 season at 25.2 ppg. The following 1978–79 season, he was 7th with a 24.0 points per game average. After the 1979–80 season, he was traded to the Seattle SuperSonics for Dennis Johnson where he played one season before heading to the New York Knicks. In 1983 he returned to Phoenix for his final NBA season. He had been injured and only played in 59 of the 82 games of his final season. In his career Westphal scored a total of 12,809 NBA points for an average of 15.1 points per game, with 3,591 assists for an average of 4.4 assists per game. He also had 1,580 rebounds, for an average of 1.9 per game. He was a 5-time All-Star and 3 times an All-NBA selection and one time a second team All-NBA selection. He is Phoenix's fifth all-time leading scorer (9,564), averaging 20.6 points (1975–80, 1983–84) and a member of the Sun's Ring of Honor. Westphal's coaching career started in 1985 with Southwestern Baptist Bible College, located in Phoenix. After compiling a 21–9 record in his lone season there, he moved on to Grand Canyon College, also in Phoenix, and after two seasons led them to the NAIA national title in 1988. In 1988, after three years in the college ranks, Westphal became an assistant coach with the Phoenix Suns under head coach Cotton Fitzsimmons, and in 1992 he succeeded Fitzsimmons as head coach of the Suns. With players such as Kevin Johnson, Dan Majerle, rookie Richard Dumas and the newly acquired Charles Barkley and Danny Ainge, the Suns made it to the NBA Finals in Westphal's first season as a coach, but eventually lost to the Chicago Bulls in six games. Incidentally, Game 3 between the two teams went to triple-overtime (which the Suns won) and is considered one of the greatest games ever played. 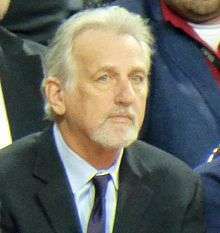 While the Suns made the playoffs during each of Westphal's seasons as coach, they did not return to the finals, and Westphal was let go during the 1995–96 season. He served as an assistant coach for a high school team in Arizona for two years before he returned to the NBA as a coach with the SuperSonics for the 1998–99 season. He coached in Seattle until he was let go during the 2000–01 season. He returned to the college ranks in April 2001 at Pepperdine University. In his first season, Westphal led the Waves men's basketball team to a 22–9 record and tied nationally ranked Gonzaga for the WCC title. The team achieved an at-large berth to the NCAA Tournament, but lost 83–74 to Wake Forest in the first round in a game played at ARCO Arena. This was the only postseason berth during the rest of Westphal's five-year tenure and he finished with an overall record of 74–72. After a 7–20 season in 2005–06, Westphal was let go on March 15, 2006. Westphal has also worked as a studio analyst for Fox Sports Net West/Prime Ticket for Los Angeles Clippers and Los Angeles Lakers games, first joining them during the Clippers' playoff run. In 2007, Westphal announced the locally broadcast USC basketball games. He worked alongside Jim Watson on FSN Prime Ticket. Westphal was also a studio analyst along with Don Maclean for the 2007 Pacific-10 Conference Men's Basketball Tournament games that aired on FSN. On June 28, 2007, the Dallas Mavericks announced they had signed Westphal as an assistant coach under head coach Avery Johnson. When Johnson was replaced by Rick Carlisle, Westphal left coaching to become executive vice-president of basketball operations (under Donnie Nelson) for the Mavericks on October 2, 2008. On June 10, 2009, Westphal was named head coach of the Sacramento Kings. On January 5, 2012, Westphal was let go as head coach of the Sacramento Kings. For the 2014–15 season, Westphal was hired by the Brooklyn Nets as an assistant to new head coach Lionel Hollins. In his first season with Lionel and the rest of the Brooklyn coaching staff, he helped the team reach the Eastern Conference Playoffs. ↑ "Greatest Game Ever Played | Celtics.com – The official website of the Boston Celtics". Nba.com. 1976-06-04. Retrieved 2012-08-08. ↑ Sefko, Eddie. – MAVERICKS: "Stackhouse steps it up – Swingman hopes to earn starting spot after increasing emphasis on conditioning". – The Dallas Morning News. – October 2, 2008. ↑ "Brooklyn Nets announce coaching staff". Brooklyn Nets. July 30, 2014. Retrieved December 13, 2014.